Is parent pathing necessary for 9.1? When installing or upgrading to 9.1 you may be requested to turn on Parent Pathing. Parent pathing is required for Ektron 9.1. Parent pathing allows code running on a website to understand its file structure. Specifically, it allows code to reference locations relative to the running location via ..\ or ../. Ektron's "relative includes" use code that relies on parent pathing. Prerequisite : If ASP does not exist under IIS, you need to install it. Navigate to the Ektron site. Double click the ASP feature. 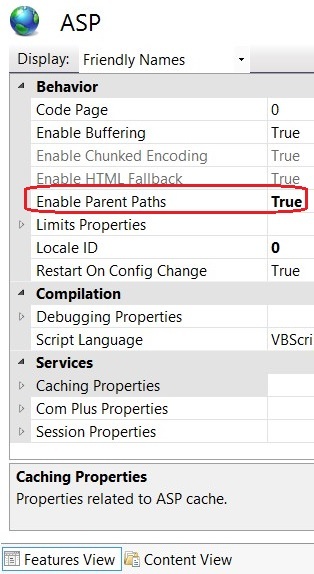 In the list of ASP properties, set Enable Parent Paths to True .